DaysOut.NL - Brunssum Market: second-hand goods and "Limburgse vlaaien" cakes reviews and trip information Brunssum limburg. At a flee market the most precious treasures are discovered. Looking for something beautiful? 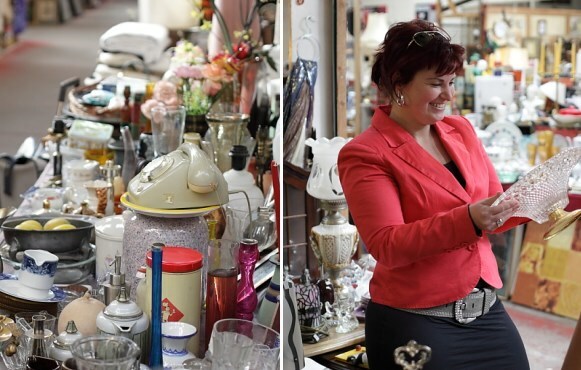 The "Vrije Markt" takes place in Brunssum every Sunday, so browse around and find beautiful second-hand goods. Who doesn't like second-hand can take a look at the brand new goods. Or dance along with the live music or eat a typical regional cake, the "Limburgse vlaai". There is always something to do or see at the Vrije Markt! The most beautiful goods are presented at "Vrije Markt" in Brunssum every Sunday. There's always music, and every third Sunday there's an auction, where everyone can join in. During a visit at the market there is more to do than browsing around. Frequently activities are organised, like the Strongest Man Competition, a falconry show, a child flee market, or a Country Event. Treat yourself with a delicious piece of regional cake, "Limburgse Vlaai" and enjoy live music. De Vrije Markt in Brunssum is the perfect place for a day out! And if you want to sell your own goods or offer a service, that's possible, too! This attraction Brunssum Market: second-hand goods and "Limburgse vlaaien" cakes in Brunssum is suitable for ladies day. Ask a question Brunssum Market: second-hand goods and "Limburgse vlaaien" cakes or ask an offer. Telephone: +31 (0)6 45 45 90 10. Note: Free access for children under 1.40 meters tall. Accessible for Disabled.. Facilities consist of: Disabled Toilet Weelchair access It is wheelchair friendly. Dogs are welcome. Data last checked on 23 februari 2018, disclaimer. Open all year round (watch the opening days). From 10:00 o'clock To 16:00 o'clock. Note: Opened from 10 AM until 4 PM in June, July and August. It is perfectly accessible by public transport. Visit the website of Brunssum Market: second-hand goods and "Limburgse vlaaien" cakes or ask a question. Date of visit: 7 juniSfeerloos, oude rommel en vergane glorie. Oogt stoffig en smoezelig. De 3 euro entree begrepen wij daarom niet zo. Date of visit: zomer 2013Ouwe meuk, ongezellig, leeg en slechte muziek. Je kunt je tijd beter gebruiken. Een aantal jaren geleden nog leuk, druk en gezellig, nu absoluut niet meer. Hangt vreemde Kafka sfeer. Als je dat leuk vindt, moet je gaan uiteraard. Limburg heeft tal van leukere plekken.